Every physical advantage can be turned into a disadvantage and vice versa. For example, in weapons fighting, if the opponent had a 6 foot Bo staff and you had a 6 inch pocket knife, the superior reach of the staff would be a large advantage. But if you made the fight happen in a phone booth the long reach of the staff would be a serious disadvantage in the confined space. 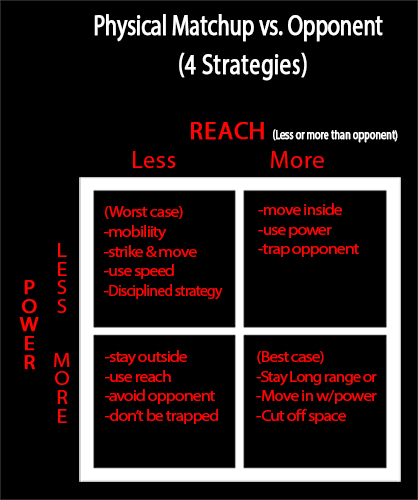 You use strategy to gain an advantage and to put the opponent at a disadvantage. There are 2 main physical characteristics that you need to evaluate when determining an optimal strategy versus an opponent. Does the opponent have more or less reach than you? Does the opponent have more or less mass/power than you? There are 2 sides to each coin. If you have more reach you try to keep to the outside. 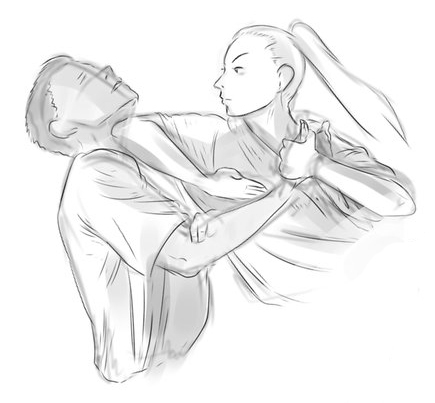 If you have less you can try to go inside and jam the opponent (like the staff example above). More mass usually translates to less mobility and speed. A bulldozer versus a Ferrari. In a pushing contest the bulldozer wins, in a maneuverability contest the car wins. You need to be able to turn the opponents advantage into a liability (or at least neutralize their advantage). Give this strategy some thought.